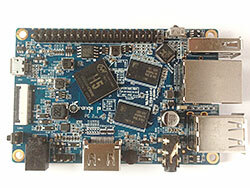 The Orange Pi PC 2, manufactured by Xunlong, is an H5 Allwinner SoC Family based 64-bit quad-core single-board computer. It was the first single-board computer from Xunlong to feature the Allwinner H5. It features Allwinner H5 quad core Cortex A53 processor, Mali-450MP4 GPU, 1GB DDR3 RAM, 3x USB 2.0 slots, 1x USB OTG port, Micro SD card slot, HDMI out, 3.5mm audio/video jack, Built-in microphone, Gigabit Ethernet, 40-pin GPIO header, IR receiver, Power button and Power and status LEDs. The H5 SoC support has matured since its introduction in kernel 4.12. Most of the board functionality for boards such as Orange Pi PC 2 are available with current mainline kernels. Some features (hw accelerated crypto, hw spinlocks, and thermal) are still being worked on and the status of some features (video engine) is still unknown due to the lack of testing. For a more comprehensive list of supported features, see the status matrix for mainline kernels. See the Manual build section for more details. OrangePi PC2 board was added to mainline kernel only (experimental) for v5.25 on 02-Feb-2017. See the H5 SoC support page. A preliminary .dts file for the board can be found here. <- Still relevant or is it already better supported? There are some somewhat abandoned 3.10 BSP code drops available in 'OrangePiLibra' and FriendlyELEC's github repos. Check the orangepi-xunlong and OrangePiLibra repositories in case of interest. It seems no device settings are contained and the BSP is broken anyway at least with regard to voltage regulation (that's also the reason vendor OS images seem to be limited to 1008 MHz since at this cpufreq those Orange Pi do not immediately crash with BSP kernel). Use the orangepi_pc2_defconfig (supported since v2017.05) build target. The H5 SoC has support in the mainline kernels. The development process, links to patches and links to kernel fork repositories are listed on the Linux mainlining effort page. Patches can also be found from the arm-linux mailing list. Use the sun50i-h5-orangepi-pc2.dtb device-tree binary. FEL is a low-level subroutine contained in the BootROM on Allwinner devices. It is used for initial programming and recovery of devices using USB. There is no FEL button on this board. Booting without an SD card automagically enters FEL mode. The board has a momentary action switch (SW4) located on the lower left corner near the 5V DC IN power jack (J1), which pulls low PL3 (R_PL_EINT external interrupt - #77, vectored to 0x0134) and KEYADC (interrupt #62 vectored to 0x00F8). A red PWR LED, D7, connected to the PL10 pin. A green STATUS LED, D8, connected to the PA20 pin. Universal Serial Bus On The Go: USB0 port on H5 SoC is accessed via the microUSB connector (CN1) on the left hand edge of the board. The USB OTG is a Dual-Role Device controller, which supports both device and host functions which can also be configured as a Host-only or Device-only controller, fully compliant with the USB 2.0 Specification. It can support high-speed (HS, 480-Mbps), full-speed (FS, 12-Mbps), and low-speed (LS, 1.5-Mbps) transfers in Host mode. It can support high-speed (HS, 480-Mbps), and full-speed (FS, 12-Mbps) in Device mode. USB Host Controller 1: USB1 and USB3 ports on H5 SoC is accessed via the dual USB A stacked connector (USB1) on the bottom right hand side of the PC2. It is fully compliant with the USB 2.0 specification, Enhanced Host Controller Interface (EHCI) Specification, Revision 1.0, and the Open Host Controller Interface (OHCI) Specification Release 1.0a. The controller supports high-speed, 480-Mbps transfers (40 times faster than USB 1.1 full-speed mode) using an EHCI Host Controller, as well as full and low speeds through one or more integrated OHCI Host Controllers. USB Host Controller 2: USB2 port on H5 SoC is accessed via the vertical USB A connector (P1) on the right hand side of the PC2. It is fully compliant with the USB 2.0 specification, Enhanced Host Controller Interface (EHCI) Specification, Revision 1.0, and the Open Host Controller Interface (OHCI) Specification Release 1.0a. The controller supports high-speed, 480-Mbps transfers (40 times faster than USB 1.1 full-speed mode) using an EHCI Host Controller, as well as full and low speeds through one or more integrated OHCI Host Controllers. The PC2 board has a 3.5mm Audio-Video (AV) jack (J4), located to the right of the HDMI connector and the two stacked USB ports. The AV jack outputs both Left and Right audio channels and a Color, Video, Blanking and Sync (CVBS) composite TV (up to 480p/576p NTSC/PAL signal from the H5 SoC TCON1 module. The PC2 has a Camera Serial Interface (CSI) interface connector (CON1) located between the microUSB connector (CN1) and the Reset switch (SW4) on the laft hand side of the board. The CSI supports 8-bit yuv422 CMOS sensor interface and CCIR656 protocol for NTSC and PAL with maximum still capture resolution to 5M pixels and maximum video capture resolution to 1080 at 30fps. The CSI camera connector (CON1) is a 24-pin FPC connector which can connect directly with an external camera module. The PC2 board has a Consumer Infrared Receiver (CIR) module located to the right of GPIO connector (CON3) to receive data from a received infrared (IR) signal to port PL11 on H5 Soc. The CIR module is implemented in hardware and provides full physical layer implementation, supports IR for remote control, has 64x8 bits FIFO for data buffer and programmable FIFO thresholds. The CIR registers are at base address: 0x01F02000. The PC2 board has a built in microphone located just to the right of the HDMI connector with frequency range specification of ~20-16000Hz. It is connected to analog input port MICIn1 on H5 SoC and analog control registers: 0x05, Linein and Gain Control Register (Default Value: 0x30), 0x06 MIC1 Gain Control Register (Default Value: 0x33), and 0x0B MIC1 Boost and MICBIAS Control Register (Default Value: 0x04). MICIn2 input is not connected. The Allwinner H5 manual does not provide the CPU clock speed information. The following comment is found in the SDK provided by Xunlong. The Orange Pi PC 2 board uses the SY8106A voltage regulator (U9) for providing the CPU core voltage (VDD_CPUX, nominally 1.2V at 6A). The default CPU voltage is 1.1V after power-on (selected by the resistors on the PCB) and can be changed at runtime by software via I2C interface (I2C address 0x65). According to the table above, this default voltage should be safe for using with the CPU clock frequencies up to 816MHz. The H5 user manual specifies 1.5V as the absolute maximum for the VDD_CPUX voltage and 1.4V as the recommended maximum. CPU core voltage (VDD_CPUX) can be measured at test point '1V1C', located just to the right of the camera interface connector (CON1). The stability of the Orange Pi PC2 was tested using HPL 2.1. Per frequency the voltage was lowered until HPL found data corruption during the tests. The results of this test show the Orange Pi PC 2 is able to run at 1368 MHz with a minimum core voltage of 1.38V. The tests fail while running at 1392 MHz with a core voltage of 1.4V. Debug UART pins are located between the 5V power input jack (J1) and the HDMI connector (CON2). The three-pin single-in-line header pins are marked as GND, RX and TX on the PCB. Just attach some leads according to our UART Howto. This page was last modified on 6 April 2019, at 02:28. This page has been accessed 47,451 times.